This is a little different from my usual woodworking. 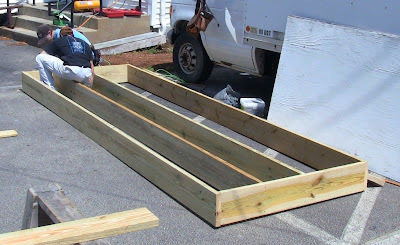 It's more general construction and carpentry work than fine joinery. But it's still building stuff and learning. 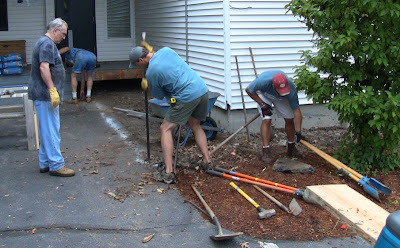 Our admin assistant at work had forwarded an email requesting volunteers from companies in the area to assist with a Habitat For Humanity project replacing the handicap ramp at Nashua Children's Home. I've always admired Habitat for their pragmatic combination of self-sufficiency, compassion, and a sense of community. The morning started out comfortably as I left home, 66 degrees after a thunderstorm, but due to the heat wave currently gripping the Northeast (and most of the rest of the country), once the sky cleared the temperature rose rapidly, hot and humid. By the time we packed up and left at 3, it was 96 degrees. 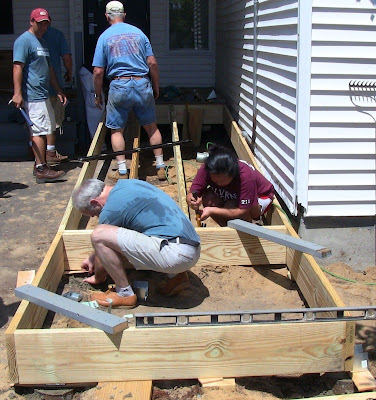 Fortunately, there were a good number of volunteers for this relatively simple project. People were able to double up and tag-team on the most physically laborious jobs, like digging holes for sonotubes. 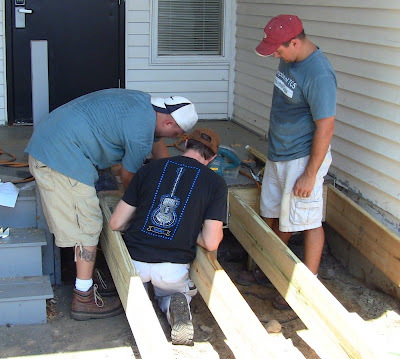 The project was run by Habitat leader Eric Moore, who works at BAE Systems. With him were Habitat regulars Tom LaRochelle, Roger Hall, and Renee Reder, who is working on her masters degree in architecture. Andy Moskal and I were there from Dell. There was a group from Amphenol TCS: Al Astbury, Clay Sammis, Brian Wozniak, and Kelly Gentry; they share the same campus as Dell, the old Digital Equipment Corporation ZKO site. Additional volunteers were Elliot Doughty and Susan Li. Interestingly, in addition to her Habitat work, Renee had been a First Lego League competitor before going off to MIT for her architectural undergrad work. There are a couple of FLL coaches in my group at work. Inspired by FLL, I had run the robotics club at my kids' middle school for four years, though we didn't participate in the competition. Like Jameel Abraham at Benchcrafted, I was a Lego-crazed builder from the age of 5. 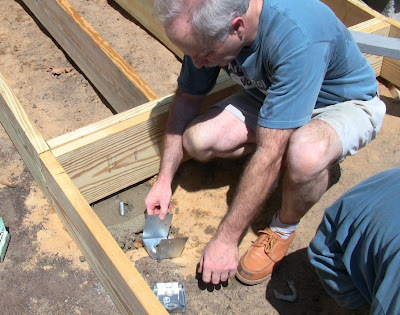 Al had run a remodeling business for a few years, so he had experience building decks and was familiar with the construction codes. 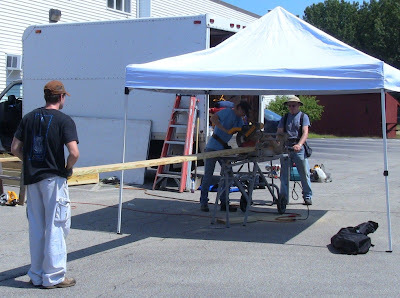 He worked closely with Eric and Roger directing the site preparation and footing construction, while Tom, Renee, and Elliot constructed the basic ramp sections. 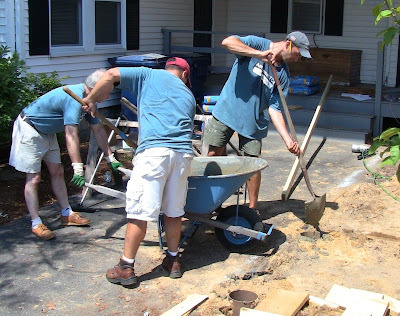 The rest of us, while capable with contractor's tools and familiar with small-scale home construction projects, served largely as the unskilled labor. 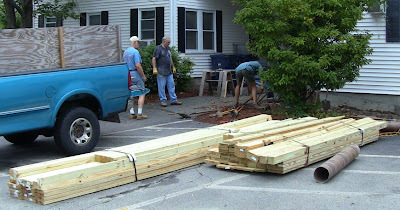 The stack of pressure-treated lumber for the new ramp. Al uses a breaker bar to start through the asphalt as Andy watches and Brian grabs a post-hole digger. There were enough diggers to have two people at a time on each hole. We soon had all the 4'-long sonotubes in their holes, everybody drenched with sweat. Eric and Roger watch as Al and Brian check the tube positioning. Fortunately the soil was mostly sandy with only a small amount of stone. Kelly cuts the rebar down to size for setting into the sonotubes. Elliot, Renee, and Tom cutting the joists for the main ramp run. By this time the sun was blazing, so I set up my portable canopy. They considered this luxury working conditions! Kelly, Brian, Clay, and Andy mixing up the concrete. After backfilling around the tubes, Clay, Brian, and Al filling them with concrete. Renee and Elliot nailing up the main ramp box. They left one joist out temporarily to cut down on weight and provide clearance while securing the box. We later nailed it in with hangers. Clay setting a J-bolt and hardware in one of the topped-off tubes. The main ramp section is in place, along with the box for the landing. Clay working on the J-bolt while Susan nails in hangers for the joists. The ramp makes a 90-degree turn at the landing, continuing down to ground level at a 5 degree pitch. Kelly, Elliot, and Brian anchoring the ramp header. 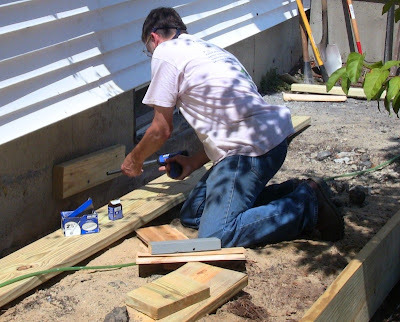 We drove large lag bolts into the porch joists and into blocks on the side that Roger had secured to the foundation with masonry bolts. This was the first time I'd used a heavy impact hammer. 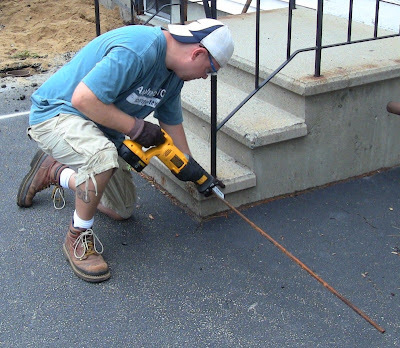 Eric using a concrete nail gun to secure anchors to the building foundation. Ka-BLAM! Nothing more could be done until the concrete had cured. By this time we were all huffing and puffing from the heat, and we had pretty much reached the scheduled end time. 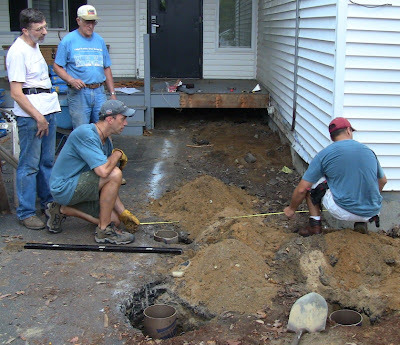 Tom said it was great to see how much work had been completed; he hadn't expected to get that far. 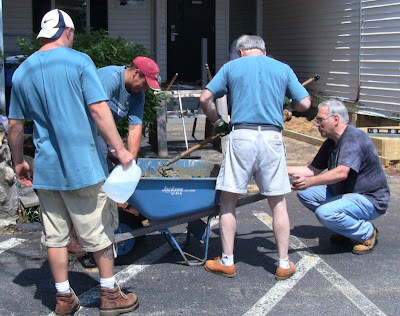 The nature of volunteer construction is that you never know if two people will show up or 20. Next Saturday, after the footings have cured, we'll anchor the ramp to them and complete the construction.